This is the Southern Italian name for the grape known elsewhere as Muscat of Alexandria. 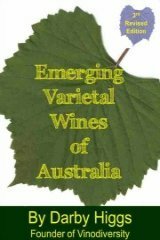 Low alcohol wines, in the 6%-10% range are starting to come into vogue. They are unashamedly aimed at the underthirties market. Crabtree of Watervale have been producing a wine under this name for several years but over the past couple of years Brown Brothers have put the name into the forefront. What Brown Brothers have done is made a low alcohol sweet sparkling wine. Their Zibibbo has an alcohol content of just 6%. It was so successful when released a ciouple of summers ago that they have now released Zibibbo Rosa a pink version which is just a bit drier. To the purists, no. But they have their place. They are pleasant as a pre dinner drink, or just a drink on a warm day. Fizzy, slightly sweet light wines are competing in a different market. They are up against the premixed industrial alcohol, sugar and cordial drinks that young people are consuming. What do you think? If you're a responsible drinker, then you are not likely to ever need to go alcohol abuse centers to seek help.